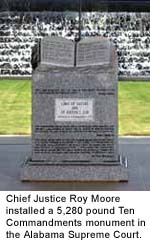 The monument was installed in the rotunda of the State Judicial Building, in Montgomery, AL on 2001-AUG-1. The building houses the Alabama Supreme Court. Chief Justice Roy Moore had been ordered by the 11th U.S. Circuit Court of Appeals to remove the monument because it violates the First Amendment of the U.S. Constitution and its principle of separation of church and state. It was removed on 2003-AUG-27, and installed in a storeroom that has no public access. Moore was suspended from office. He continued his fight to be reinstated and to restore the monument to the building rotunda. "The Court of the Judiciary's crucial failure to distinguish between lawful and unlawful orders sets a dangerous precedent for all judicial officials in that...it requires obedience to all court orders including those that are illegal and unethical." "... forsake an acknowledgment of God....Both the Alabama and the federal constitution prohibit Alabama from forcing public officers to choose between their job and their God." John Giles, of the Christian Coalition in Alabama likened the process whereby judges evaluated judges is like a "..fox guarding the hen house...." He said: "We embrace restoring us to the original constitutional process of the Legislature impeaching judges." House Speaker Pro Tem Demetrius Newton, (D-Birmingham) said: "I think it's a horrible idea." He is concerned that having the legislature discipline judges would politicize the process. Representative Greg Albritton, (R-Excel) favored the proposal. He said: "The Legislature has given up way too much authority to the executive and judicial branches. It's time we faced responsibility and took on that job ourselves,"
2004-JUL-17: USA: Monument to tour the country: Former Chief Justice Roy Moore has given the Texas-based group Veterans Standing for God and Country permission to take his Ten Commandments monument from its storage area in the Alabama Judicial Building on tour around the U.S., ending in Washington, DC. Moore has asked Congress to allow the monument to be displayed at the Capitol building. He wrote: "At a time when our sacred institution of marriage is being assaulted by those who would deny the law of God, Americans need to be reminded of our moral foundation. I have agreed to allow the Veterans Standing for God and Country to display the monument in various locations across the country." A member of the group, Wiley Drake, who is the pastor of the First Southern Baptist Church in Buena Park, CA said: "We need to bring back to the attention of the American public that they need to acknowledge God in public because it is absolutely necessary for this nation to survive." 2005-MAR-30: Roy Moore's book is released: So Help Me God: Broadman and Holman released Roy Moore's book: "The Ten Commandments, Judicial Tyranny, And The Battle For Religious Freedom." "Chief Justice Roy Moore believes the state must acknowledge the moral principles on which America was founded and that it is not illegal to do so. While the separation of church and state may be a credible and legitimate tenet, it has been largely misconstrued and abused during the last forty years." "Moore was sworn to uphold the Constitution of the United States. His critics, both within conservative circles and without, have maintained that he violated the law by disobeying the order of a federal judge to remove a monument of the Ten Commandments. But Moore brilliantly argues that those who have ordered him to violate his oath have, in fact, broken the law." "So Help Me God will articulate why he believes elected and appointed government officials have the right and the obligation to acknowledge God as the foundation of American government and jurisprudence." Read reviews or order this book safely from Amazon.com online book store. As of 2005-OCT-04, it was available new from Amazon.com for $16.49 plus shipping, and was available -- both new and used -- at a much lower cost from Amazon Marketplace Sellers. 2006-JUN: He ran for governor of Alabama but lost in the primary by almost a 2-to-1 margin. 2009-JUN: He ran again for governor and failed again in the primary. 2011-NOV: After a failed bid to be considered for the presidency in both the Republican and Constitutio Party, he announced that he would seek his former post as Chief Justice of the Alabama Supreme Court. in the elections of 2012. 2012-NOV: He was reelected as Chief Justice. 2015: He played a major role in preventing the attainment of marriage equality in Alabama, at least for a while. 2016-SEP: The 10 Commandments monument is now at Coosa Christian School which is located in The Church at Wills Creek in Gadsden, AL.